I also pointed out that, under HST, resource companies no longer pay provincial sales tax, a savings of hundreds of millions annually. Coal, the largest mineral production in BC, sold at prices 567% higher in 2011 than 2001. Copper, the second most valuable production had prices rise 386% during the same period. 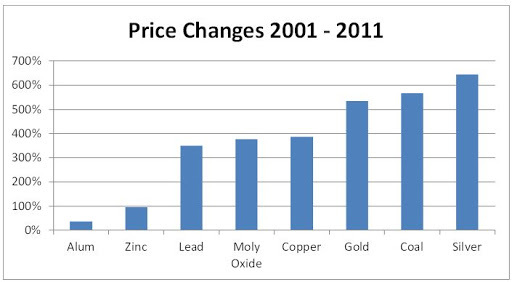 All commodity prices have changed significantly. These statistics are taken from the Ministry of Energy, Mines and Natural Gas. Citizens enjoying a substantial rise in before-tax income across the past decade pay substantially higher taxes; metals and minerals extractors, despite exceptional revenue growth, pay less. Teck, BC’s largest mining company, had gross revenue of $2.4 billion and cash operating profits of $402 million in 2001. Ten years later, revenues were $11.5 billion and profit from operations $4.5 billion. So, Teck’s operating profits went up over 1100% but BC citizens’ take from natural resources went down by 32%. By the way, Teck companies and chair Norman Keevil donated $1.14 million to the BC Liberals in recent years. Other resource companies, Goldcorp, for example, donated millions more. The returns on political donations have been substantial. I’m left wondering why the BC Liberals sold out so cheaply if all they got from Teck and other big mining companies was a few million dollars. [Auditor General John] Doyle’s proposed treatment of the credits that government makes available to petroleum producers who drill deeper (and hence more expensive) natural gas wells. The credits can be used to reduce royalties paid to government from those same wells. Lately, with output slackening because of the glut of natural gas, the credit-holders have been banking them to claim in future years. The auditor general argues that the credits should be booked as a liability, thereby increasing the deficit by a hefty $702 million. Most every professional accountant in the province would agree with the Auditor General on this one, although Vaughn Palmer is not persuaded. Clearly, the government has an existing material liability owed to gas producers that will reduce revenues received in the future and that liability is unrecorded. So even a dummy like myself who does double entry bookkeeping understands these credits would be posted in the liability side of the ledger. Yes the credits do not represent cash paid to government, but they are still liabilities. The comptroller should be dismissed as he clearly does not understand the responsibilities associated with GAAP. Palmers opinion of the matter is moot. He is not an accountant. These credits should have a best-before date. If a restaurant gives out free-meal vouchers, they usually have an expiry date… otherwise the business is carrying a potential loss forever. My next worry is that these vouchers can be sold or traded, as carbon credits are. The comptroller has already been dismissed. One of the few position the CC government cut…and not a peep from the MSM! Both downgrades came because of concerns about the rising debt for both the province and the Crown corporation, combined with a sluggish economic performance that results partly from slumping revenues. Great reading as usual… but today I just want to wish you & your family a very Merry Christmas. for the various industries involved. Not that I have any information about it, I do not even live in BC, but Public Sector accounting is not the same as Financial reporting for, say, a business. An earlier comment mentioned GAAP, and stated that for a corporation the future liabilities would be booked as, well, liabilities. Public sector accounting is evolving continuously in Canada, but the tradional approach to gvt. accounts was that there were no accruals, and everything was accounted on a cash basis. In other words, transactions are booked at cash values, when they occur. The rationale behind reflects the accunting principle of matariality, that is that it is a waste of time fiddling with little accruals when you are aggregating billions and billions in spending. That is changing, but this is not an obvious case of fiddling the liabilities as you seem to think. I must say that if the liabilities are actually that large, they would appear to be material, and therefore ought to be acknowledged in the statements. If you were to read through reports of Auditors General, the current one and predecessors, you would understand this BC government chooses to avoid using standards recommended by Canada's Public Sector Accounting Board when there is political gain to be had.